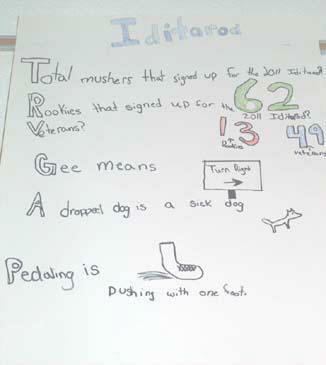 For the past two weeks, my class has put an iditarod chart together and have picked out some mushers. Then, we would follow them on a map. My mushers names were Peter Kaiser and Wattie McDonald. Peter�s number was #54. McDonald�s number was #38. Peter�s hometown is Belhel, Alaska. McDonald�s hometown is in Scotland. Peter finished in 8th place. McDonald finished in 36th place. I have learned a lot about the iditarod. I have learned that the iditarod is vary dangerous and may cause death. 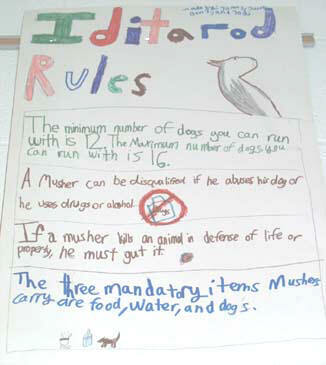 I have also learned the rules of the iditarod. One rule is you can be disqualified for abusing your dogs, and using drugs. 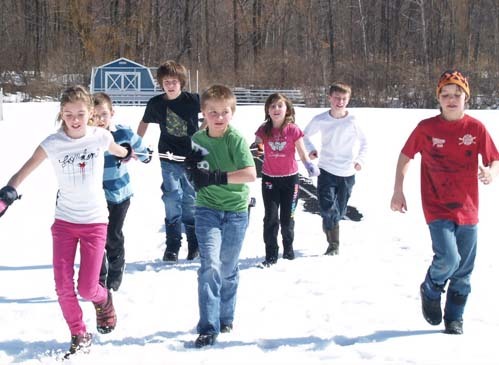 My class and I were following the Iditarod racers. The people I drew by there bib number were 23, 26, and 12. The first person I picked was Melissa Owens. She lived in Nome, AK. Her number is 12. My second person I picked was Hans Gatt. He lived in Whitehorse, YT. His number is 23. The last person I picked is Ellen Halverson. She lived in Wasilla, AK. Her number is 26. Hans Gatt finished in 3rd. Ellen Halverson in 48 place. Melissa Owens is out of the race. What I learned about the Iditarod is that it is really hard. We even did our own Iditarod race! We called it the Portarod 400. The stuff that is involved in our race was a sled, dogs, and treats. It was a quarter mile long and we did two of them. The treats were scooby-doo dog bone treats. My thoughts about the race is that it will be hard. Also I think that you have to pay lots of money to get in the race. 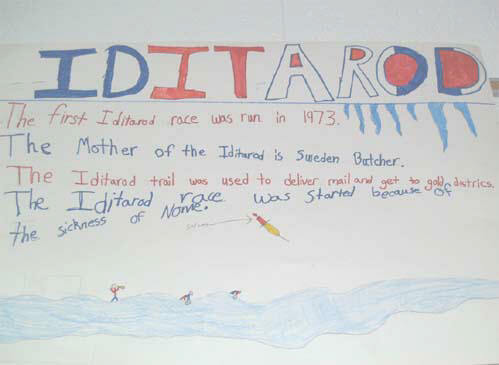 This year my class and I learned about the Iditarod. We had to make and color dogs. The dog mushers that I was following were numbers 59,13, and 55. There names were Cim Smyth, Bruce Linton, and Kelly Maixner. Cim Smyth lives in Big Lake, AK USA and finished with 9 dogs. Bruce Linton lives in Kasilof, AK USA and finished with 10 dogs. Kelly Maixner lives in Big Lake, AK USA and finished with 12 dogs. All their average speeds were 4-10 mph. I learned that the iditarod is very tiring. 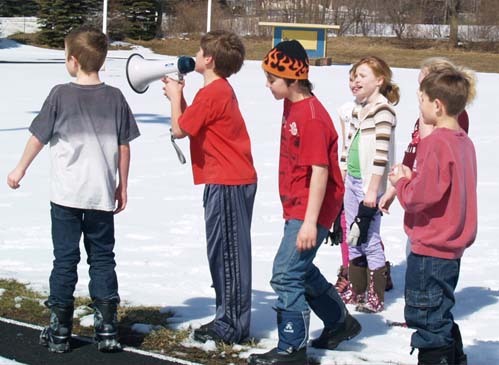 At our track at my school we spilt the class in two teams. 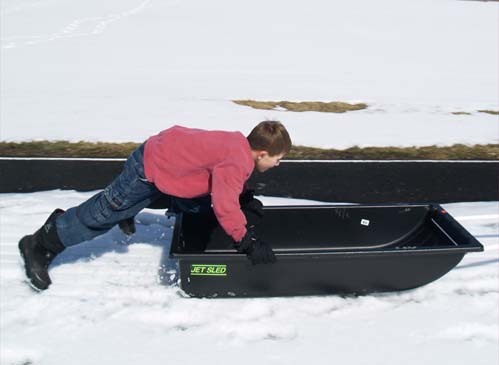 Then we got a sled and raced like we were mushers and the dogs. 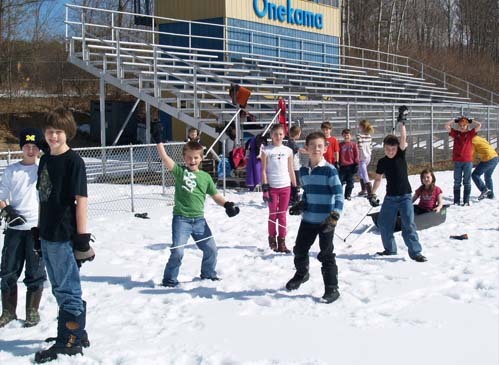 We named our race we did at the track � Portarod 400�. 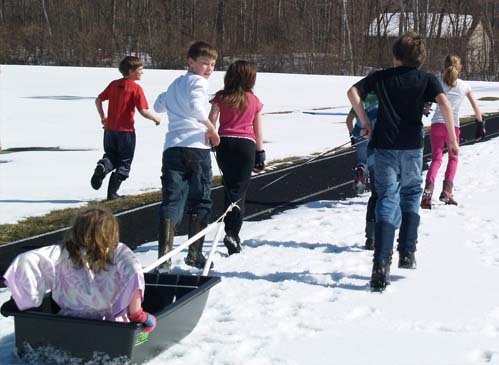 We had to pull a sled with a person in it. We pulled � mile. Afterwards we got dogie treats.I thought it was really fun. It was cool to learn that the last person to go to the finish gets the red lantern award. I also learned that Lance Mackey was going for his fifth win, but the first person to finish was John Baker. My people finished in 30th, 23rd, and 21st. I thought that the Red Lantern was really cool because that is a reward to the last person to finish the race. So even the last person gets a prize. I am so glad I got to learn about the Iditarod. 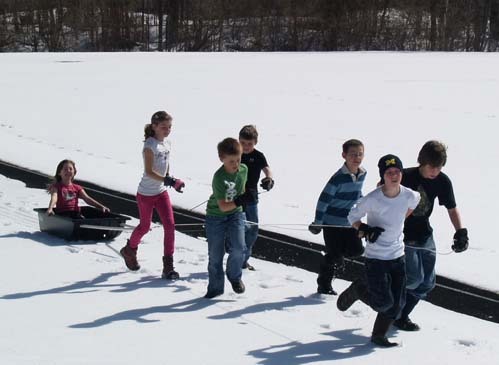 This year my class and I followed the 2011 Iditarod. My dogs and mushers were numbers 43 Ken Anderson , 35 Hugh Neff, and 25 Tom Thurston. 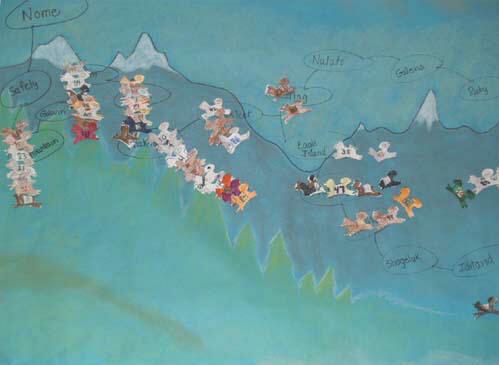 We made a map of the route of the Iditarod, but first I will tell you about my mushers. Ken Anderson lives in Fairbanks, Alaska. He had 8 dogs when he finished. Ken finished in 9th place. Ken�s average speed was 4.98. Hugh Neph lives in Evanstan, Alaska. Hugh had 8 dogs also when he finished the race. Hugh Neff came in at 5th place His average speed was 5.12. Tom finished in 41st place. Tom Thurston lives in Oak Creek, Colorado. He had 12 dogs when he finished. His speed was 8.37. Some of the things I learned was the Red Lantern award was giving to the last pearson that finished the race. Another thing that I learned was �Gee� means turn right and �Ha� means turn left. I liked tracking the Iditarod this year because you got to pick out your own dogs and see how far they went. All of my dogs finished the race. I am proud of them. We had a Portarod 400. That is just like the Iditarod. We didn�t have dogs we just had people play in the race. 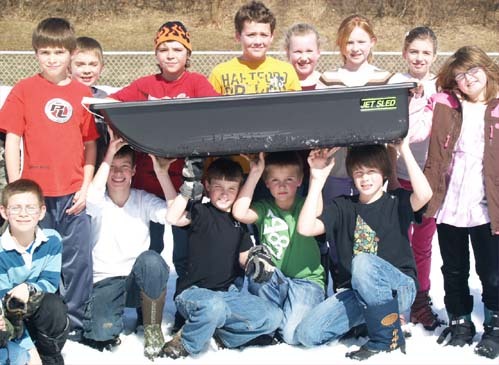 We had a sled and 6 people pull it. In the sled there was a musher. We went around a track two times each. I was a dog and a musher. We had a hard time getting into the track because we went under the fence and we got a little muddy. After the Portarod 400 we got to walk back and I got the mega phone and, I yelled as loud as I could in it. Then sadly we had to leave. On the way back Jacob ate a lot of the Scooby-Doo snacks then I got some. I had a great time at the Portarod 400. 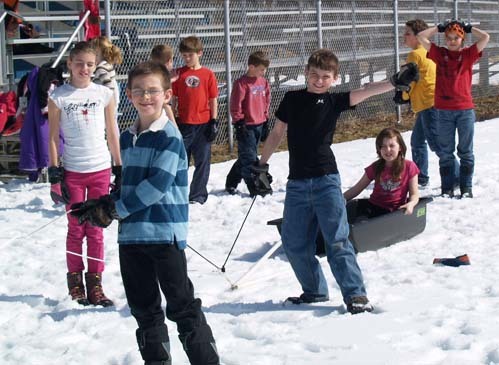 The fourth grade class is studying the Iditarod race. We each drew a musher out of a basket and we each got three mushers. My first musher is Deedee Jonrowe. She finished in 11th place and her bib number was 2. She lives in Willow Alaska. My next musher is Matt Gibblin and he finished in 40th place. His bib number is 60 and he lives in Juneau, Alaska. My last musher is Karin Hendrickson she finished in 24th place. Her bib number is 37 and she lives in Willow, Alaska. 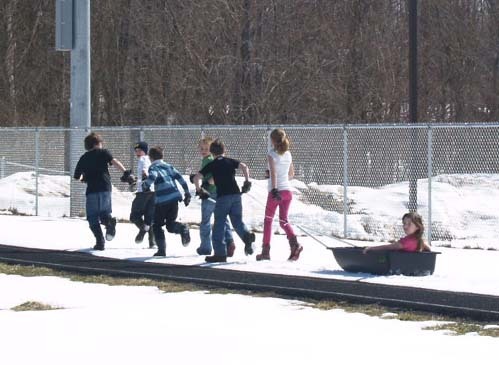 We had our own sled race called the Portarod 400! We had 6 people as dogs and we had one musher in the sled. It was very fun! We called it the Portarod 400 beacause we ran a quarter mile around the track. In the end we got snacks for some energy to get back to the school. 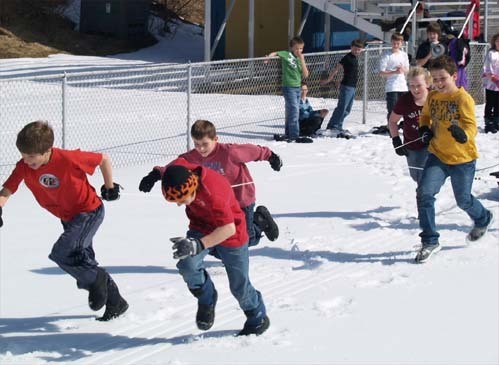 The portarod 400 was a race our class had around the track. What happened was our class separated into two groups and raced. We had a little trouble getting into the track and we had to crawl under the fence. Our group had to pull Jodi around the track. The next time around we had to pull Sarah. She was a little bit heavier than Jodi so it was harder to pull her. We got timed because there was only one sled. At the end we got gram cracker scooby-doo snacks. I thought it was kind of fun. It must be hard for the dogs to pull the mushers. The Portarod 400 was fun because we got to run a half a mile around the track. Sebastian Schnuelle was one of my racers. His number was 31. His home town was in Wuppertal Germany. He finished in 6th place. He finished with 12 dogs. He finished in 9 days 3 hours 55 minutes and 12 seconds and with an average speed of 4.77 MPH. Another racer I had was Kris Hoffman. He scratched at the Grayling. checkpoint. His bib number is number 8. His average speed was 3.5 MPH. We did a race for the iditarod called the Portarod 400. We had a lot of fun. 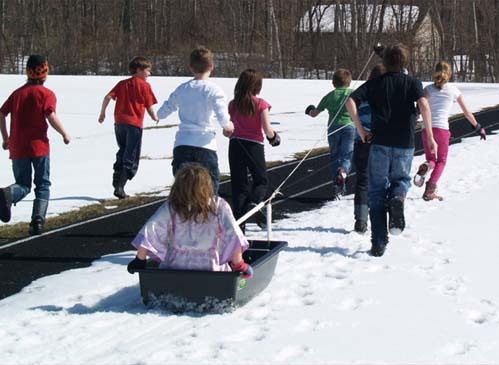 We went out to the running track with a sled. We got ready and got in position and started to race. We had one musher in the sled and seven people dogs. Then we started the race. Team one went once and did their lap then team two went around once. Team one won the first round and after that we raced again. Team one won round two of the race. After we all got finished both teams got a box of Scooby snacks. Then we went inside and that was the story of our sled dog race. I�ve been studying the Iditarod. I had Ramey Smith from drawing out of a basket at school. His average speed was 4.96 mph. His time from Anchorage to Nome was 8 days 19 hours 50 minutes and 59 seconds, good for 2nd place. He finished on Tuesday March, 15, 2011 10:50:59. His home town is Willow, Alaska USA. My second musher was Allen Moore. He finished in 24th place. His average speed was 4.24 mph. He finished in 10 days 7 hours 37 minutes and 7 seconds. He finished Wednesday, March 16, 2011. My last musher was Jessica Hendricks. She scratched out of the race. Her last checkpoint was Nikali. Her average speed was 5.60. 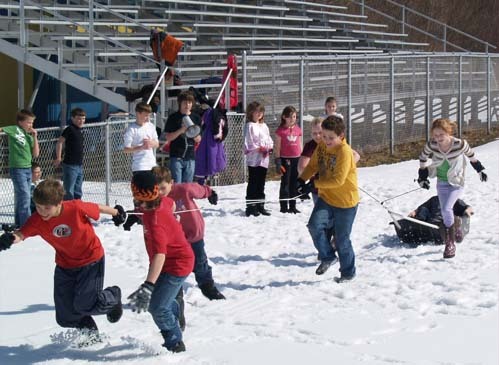 At school we did a little Iditarod thing where there were six people on the ropes for the dogs and one person in the sled as the musher . We called it the Portarod 400. It was fun. We ran one time around the track and then we got to have Scooby snacks. I learned that the Iditarod was a lot longer than I thought. 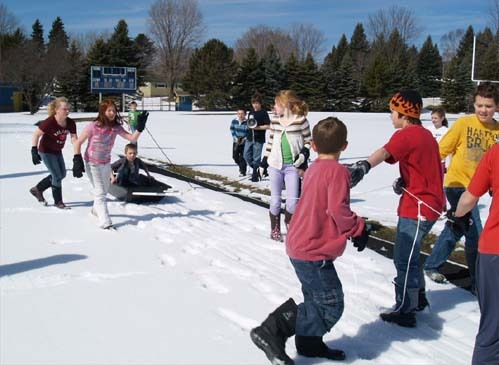 We followed the Iditarod in our class and my mushers were #46 Paul Johnson who finished in 34th place, #44 Brennan Nordan who scratched, and #50 Heather Siirtola who finished in 46th place. 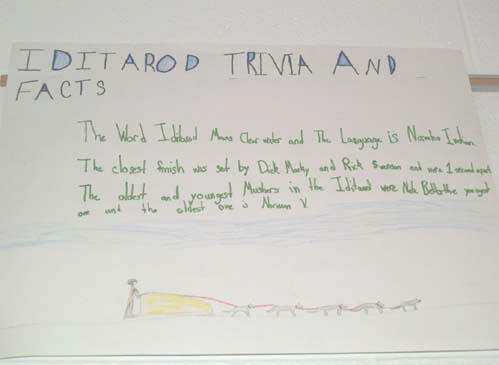 I did not learn any thing new about the Iditarod because grandpa and grandma go every year so I know a lot about it. 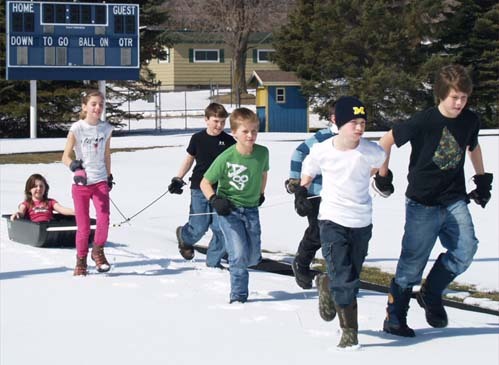 Our class had a dog sled race on the track and we had to be the dogs. We did a quarter mile two times so total a half a mile. We called it the Portarod 400. 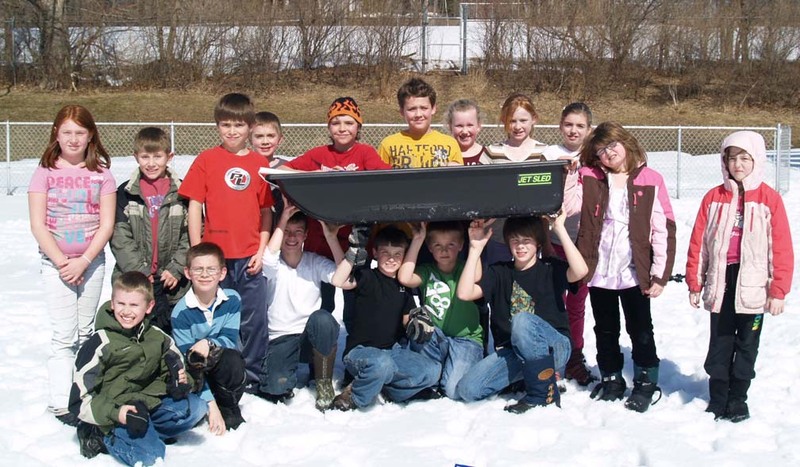 It was way to hot out so that made it harder to pull the sled. 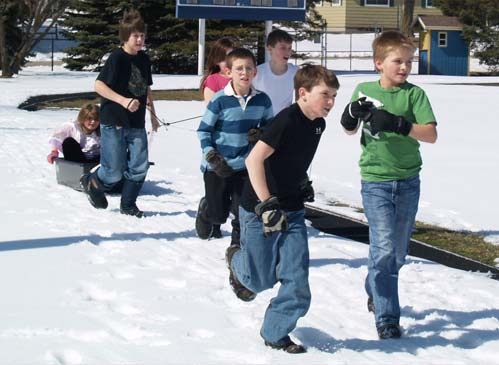 This year my class followed the 2011 Iditarod. We learned a lot about the race and mushers in the race. The mushers I had to follow were bib number 10, and 11. Martin Buser the guy with bib number 11 finished in 18th place. Although Martin finished, Robert Bundtzen didn�t and he dropped out of the race. Robert lives in Anchorage, Alaska and Martin lives in Winterthur, Switzerland. One thing I know about the Iditarod is that the Iditarod is the best part in the dogs life. Another is the the dogs run 1150 miles to finish the whole race. We also got to run as the dogs in our own Iditarod. We called it the Portarod 400. At the end we got to eat Scooby Doo dog treats. ( Oh and just a secret they were gram crackers. They were good!) Lots of running was involved in our race! It was a half of a mile. It was pretty fun. I want to do it again. This year we followed the Iditarod race in Alaska. We each had three people to keep track of. I had Micheal Williams, Kristy Berington, and Heather Siirtola. Micheal Williams bib number was 41, his hometown is Akiak, Arkansas. He finished in 13th place with 8 dogs. His average speed was 4.61 miles per hour. He finished in 9 days, 11 hours, 59 minutes and 5 seconds. Kristy Berington was bib number 7, her hometown is Kasilof, Arkansas. She was the 30th person to finish, she had 11 dogs. Her average speed was 4.02 miles per hour. Heather Siirtola is bib number 50, her hometown is Talkeetna, Arkansas. She was the 47th person to finish, she had 10 dogs in, her average speed was 3.19 miles per hour. I learned a lot about the Iditarod. One thing I learned is the Iditarod race is over 1150 miles long. I hope we learn about the Iditarod next year. I missed the Portarod 400 this year because I was sick. The Iditarod is about sled dog racing in Alaska. We had a musher drawing in class and I drew Jodi Bailey. Jodi drew bib number 16 so she started in position 16. Jodi Bailey lives in Chatanika, Alaska. Jodi Bailey average speed was 4.24. Bailey Snodgrass start position was 24. He finished in 37 place. Bailey Snodgrass lives in DuBios, Wyoming. Bailey Snodgrass average speed was 3.82. Hugh Neff started in position 35. He finished in 5th place. Hugh Neff lives in Tok, Alaska. His average speed was 5.12. We kept track of the mushers in our class until the iditarod was done. It was fun keeping track.I learned that there is checkpoint called Rohn. learned that mushers can�t drink during the race. 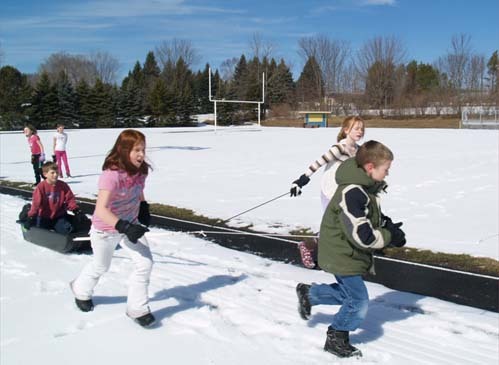 Our class did a dog sled race at the track. We called it the Portarod 400. There was two teams, team 1 and team 2. In the race we were the dogs and we got treats, Scooby Doo snacks to eat. In the race I was on team 1. It was a quarter mile run around the track. It was fun doing the Portarod 400. I pick Justin Savidis out of 62 mushers. He is from Willow, AK, USA he had bib number 63. He finished in 39th place Tue, March 15th with 9 dogs. His average speed 3.82 mph. Magnus Kaltenborn was my 2nd pick. He lives in Lillehammer, Norway his bib number is 22. He finished in 33rd place. He finished with 9 dogs. His finish time was 11 days 11 Hours 55 Minutes 2 seconds. His average speed 3.81 mph. My last musher was Judy Currier. She was born in Fairbanks, AK. Her bib number was 29. She scratched in Anvik on Saturday, March 12, with 13 dogs. A lot of mushers once they know the track keep coming back to run it over and over. Mushers are not aloud to use drugs and alcohol. Jared N.
For the Iditarod I have two mushers, Jessie Royer who finished in 10th place and Lance Mackey who finished in 16th place. Jessie finished with 9 days 9 hours 23 minutes and 17 seconds and only 7 dogs left and her bib number is 58 and lives in Fairbanks, AK. Lance Mackey has 4 Iditarod wins, his bib number is 17, he finished in 9 days 17 hours 55 minutes and 34 seconds and he lives in Fairbanks, AK. I learned that the race was over 1000 miles.